Stephen Decatur was born on the eastern shore of Maryland, Worcester County, January 5, 1779. The family was of French extraction in the paternal line, and of Irish on the maternal side. The grandfather was a native of La Rochelle, in France, and married a lady of Newport, R. I., where Stephen, the son of the commodore, was born. When a very young man he removed to Philadelphia and married the daughter of an Irish gentleman named Pine. Decatur was bred to the sea and commanded a merchantman out of the port of Philadelphia, until appointed to the sloop-of-war, Delaware. Upon the completion of the frigate Philadelphia, the command of it was given to him. The elder Decatur had one daughter and three sons. The daughter was twice married, her first husband having been killed in a duel. The sons were Stephen, James, and John P., all of whom grew to manhood. The boys were educated at the old Philadelphia Academy in Fourth Street. Admiral Charles Stewart attended the same school and was an intimate friend of Decatur through life. Many of the incidents of this sketch were received by the writer from Stewart, who fully appreciated the manliness, courage, and nobility of the sailor, now accepted as the foremost type of the heroes and founders of the American navy. "Decatur was a born fighter," said Stewart; "I never knew a boy so fond of a bout as he. I sat near him at school and have known weeks to pass, without a single day in which he did not arrange a contest with one of the boys. We generally adjourned to the Quaker burying-ground opposite, and had it out among the tombs. Decatur despised meanness of every description, and rarely was beaten in a fight. When only fifteen, he half killed a partially intoxicated man who insulted his mother and refused to apologize. He never knew when he was whipped, but would hang on like a bull-dog. I was a few months older than he, but we were appointed midshipmen in the same year, 1798. Our intimacy was never broken by the slightest incident." 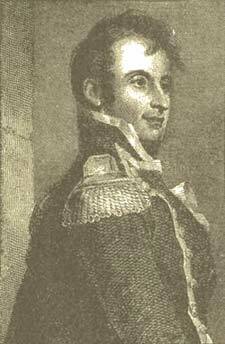 Upon entering the navy, in March of the year named, Decatur joined the frigate United States, under command of Commodore Barry, who had obtained the warrant for him. He served with Barry until promoted to a lieutenancy. The United States needed repairs, and not wishing to stay in port, Decatur applied for orders to join the brig Norfolk, then bound to the Spanish Main. After one cruise he returned again to port and resumed his station on the United States, where he stayed until our naval troubles with France terminated. He was next ordered to the Essex and sailed with Commodore Dale's squadron to the Mediterranean. Returning home once more, he was appointed to the New York, one of the second squadron under command of Commodore Morris. When he again came back, he was ordered to command the Argus, to proceed with her to join Commodore Preble's squadron in the Mediterranean, and on his arrival there to resign the Argus to Lieutenant Hull and take charge of the schooner Enterprise, then commanded by that officer. The exchange being made, Decatur sailed to Syracuse where the squadron was to rendezvous. There he learned of the disaster to the Philadelphia. That frigate, as the reader will recall, ran aground while blockading Tripoli (with which country we were at war), and was captured by the Turks. Commodore Bainbridge and his crew of more than three hundred, among whom were Porter, Jones, and Biddle, were made prisoners and immured in a gloomy dungeon. Decatur quickly formed a plan for capturing or destroying the frigate. Preble, to whom the proposal was submitted, refused at first to give his consent, but his impetuous lieutenant won him over and was allowed to lead the expedition. Decatur selected the ketch Intrepid, which he had captured a few weeks before, and manned her with seventy volunteers, chiefly his own crew. He sailed from Syracuse, February 3, 1804, accompanied by the United States brig Siren, Lieutenant Stewart, who was to aid with his boats and to receive the crew of the ketch, should it be found expedient to use her as a fireship. 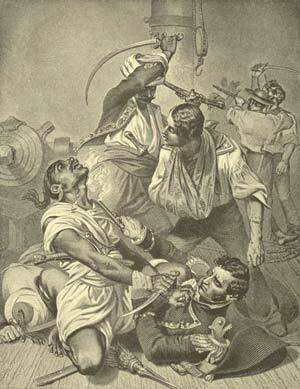 The weather was so tempestuous that it required fifteen days to reach the harbor of Tripoli. It was arranged by Decatur and Stewart that the ketch should enter the harbor about ten o'clock that night, attended by the boats of the Siren. A change of wind threw the Siren six or eight miles away from the Intrepid, and, fearing to wait for the boats, Decatur decided to adventure alone in the harbor, which he did about eight o'clock. Decatur's conflict with the Algerine at Tripoli. The Philadelphia lay within one-half gunshot of the Bashaw's castle and of the principal battery; two of the enemy's cruisers were only a couple of cables' length away on the starboard quarter, and their gunboats were within one-half gunshot on the starboard bow. All the guns of the frigate were mounted and loaded. Although it was only three miles from the entrance of the harbor to the frigate, the wind was so light that the Intrepid did not get within hail until eleven o'clock. At the distance of two hundred yards, the frigate hailed the ketch and ordered her to anchor under threat of being fired into. Decatur's Maltese pilot, by his direction, replied they had lost their anchor in a gale of wind off the coast and were unable to do as commanded. When within fifty yards Decatur sent a small boat with a rope to make fast to the frigate's fore-chains. This was done and the Americans began warping the ketch alongside. Not until that moment did the Tripolitans suspect the character of the Intrepid. They were thrown into confusion, during which the two vessels came together. Decatur was the first to leap aboard, followed immediately by Midshipman Charles Morris. A minute passed before their companions could join them, but the Turks were too terrified to sweep the daring officers from the deck, as they might have done in the twinkling of an eye. As soon as Decatur could form a line equal to that of the enemy, the charge was made. Twenty of the Turks were killed, many jumped overboard, and the rest scurried to the main deck whither they were pursued and driven into the hold. The Americans had hardly gained possession of the frigate, when a number of launches were seen hurrying about the harbor. Decatur decided that the best defence could be made by staying on the frigate, and he prepared to receive their attack. Meanwhile, the enemy had opened fire from the batteries and the castle and from two corsairs lying near. As the launches did not approach, the lieutenant ordered the ship to be set on fire in several places. The flames spread so fast that it was with the utmost difficulty the Americans were able to reach the ketch. At that critical moment, a propitious breeze sprang up and carried the Intrepid out of the harbor. She had not lost a man, only four being wounded. For this exploit, Decatur was promoted to the rank of post captain, there being no intermediate grade. The honor was specially gratifying, since the promotion was made with the consent of every officer over whose head he was raised. It should be stated that at that time the rank of captain was the highest in the navy. A commodore was simply the senior officer of a squadron and might be a master, commandant, a lieutenant, or midshipman. It was decided some weeks later to make an attack on Tripoli. The King of Naples loaned six gunboats and two lombards to Commodore Preble. These were formed in two divisions, Decatur commanding one and Lieutenant Somers the other. The squadron which sailed from Syracuse included the frigate Constitution, the brig Siren, the schooners Nautilus and Vixen, and the gunboats. Adverse winds deferred the attack for several days. Finally, on the morning of August 3d, the weather being favorable, the signal was given from the commodore's vessel to prepare for action. This signal to open the bombardment was made at nine o'clock. The gunboats were cast off and advanced in a line ahead, led by Captain Decatur and covered by the frigate Constitution and the brigs and schooners. The enemy's gunboats were moored along the harbor under the batteries and within musket-shot. Their sails had been taken from them and they were ordered to sink rather than abandon their position. They were aided and covered also by a brig of sixteen and a schooner of ten guns. Before entering into close action, Decatur went alongside each of the boats and directed them to unship their bowsprits and follow him, as it was his intention to board the enemy's boats. Lieutenant James Decatur commanded one of the boats belonging to Commodore Preble's division, but being farther to the windward than the rest of his division, he joined and took orders from his brother. When Captain Decatur in the leading boat came within range of the batteries, they and the gunboats opened fire. He returned it and pushed his way among the boats. At this juncture, Commodore Preble, fearing the results of Decatur's rashness, ordered the signal to be made for retreat. This command brought to light the singular fact, that in making out the signals before going into battle, no one had thought of that which ordered a retreat. It was impossible, therefore, to recall the daring Decatur. The enemy's gunboats contained forty men each and ours the same. Decatur had twenty-seven Americans and thirteen Neapolitans. On boarding the enemy, the latter held back, but our countrymen charged eagerly forward. Ten minutes sufficed to clear the deck. Eight of the Turks plunged into the hold, some fell while fighting, and others leaped into the sea. Only three of the Americans were wounded. As Decatur was about to withdraw with his prize, his brother's boat came under the stern. The men called to him that they had engaged and captured one of the enemy, but her commander, after surrendering, had treacherously shot Lieutenant James Decatur, pushed off while the crew were recovering the body, and was at that moment making all haste for the harbor. Decatur was infuriated on hearing this and resolved that the miscreant should not escape. With his single boat he pressed with all possible speed within the enemy's line, and running aside the offending boat, bounded over the gunwale, followed by eleven Americans, all that were left to him. Then followed the most desperate hand to hand fight conceivable, the issue being in doubt for twenty minutes. There have been many accounts of Decatur's exploit on this Tripolitan gunboat, with considerable variation as to particulars. That which follows is the story as it was told to me by Admiral Stewart, who received it from Decatur himself, immediately after the fight. Decatur presented the weapon, called an espontoon, to Stewart, and I naturally examined it with great interest. The handle was of ivory and the blade perhaps eight or ten inches long, being very narrow and curved like a scimetar. It had no edge, was sharply pointed, and evidently made for thrusting. Nothing could stay the fury of Decatur. He easily identified the commander by his immense size and gorgeous uniform. He eagerly sought out the American and they instantly came together in the fight to the death. Decatur had a cutlass, and the Turk a pike. The latter inflicted a slight wound on Decatur's breast, and in parrying the stroke his sword broke off at the hilt. Flinging the weapon aside, the American sprang like a tiger at his antagonist. The two fell to the deck, Decatur under, and flat on his back. The Turk had the weapon I have described in the front of his sash and attempted to withdraw it to give the finishing thrust. Decatur flung his legs over his back and with one arm held his enemy so tight against his body that he could not force his hand between. In this position, Decatur with his free arm drew a pistol from near his hip, reached over the back of the Turk and fired downward, directly toward himself. "It was just like Decatur," said Stewart; "the chances were ten to one that the bullet would pass through both their bodies, but luckily it met a bone and the huge barbarian rolled off dead. The two were half-smothered by others fighting and tumbling over them, and it was with the utmost difficulty that Decatur freed himself from them and rose to his feet." While this fierce struggle was going on, a Turk fought his way forward and aimed a fearful blow at Decatur, who was not aware of his danger. Reuben Jones, an American sailor, so desperately wounded that he could not use his arms, flung himself between them and received the blow on his skull, which was fractured. It is a pleasure to record, however, that the brave fellow finally recovered and lived many years on a pension from his government. Decatur succeeded in withdrawing with both prizes, and the next day was honored with the highest commendation in general orders from Commodore Preble. When the latter was superseded in command of the squadron, he gave the command of the Constitution to Decatur, who had some time before received his commission. From that ship he was removed to the Congress, returning home on her on the conclusion of peace with Tripoli. Decatur was next employed as superintendent of gunboats, and March 6, 1806, was married to Miss Susan Wheeler of Norfolk, the only child of wealthy and cultured parents. The union was a most happy one, though no children were born to the couple. In the month of June, 1807, the British frigate Leopard, while cruising off the coast of Virginia, poured several broadsides into the American frigate Chesapeake, commanded by Captain James Barron. England, as will be remembered, insisted on the "right of search," and the British Captain Humphreys claimed that the American had several English deserters on board. The Chesapeake had three men killed and eighteen wounded, and being unprepared for action, struck her colors. Captain Barron was court-martialed and sentenced to five years' suspension without pay from the service, for what was deemed a cowardly act on his part. Commodore Decatur succeeded him in command of the ship, being transferred to the United States, when she was again put in commission. October 25, 1812, in latitude 29* N., longitude 29* 30' W., Decatur fell in with the British ship Macedonian, of 49 carriage guns (the odd one shifting). This frigate was the largest of her class, two years old, four months out of dock, and reputed one of the best sailers in the English service. Taking advantage of the wind, the enemy fought at her own distance. The battle lasted one hour and fifty minutes. The United States poured such an incessant fire into the Macedonian that the shouts of her crew were plainly heard. She lost her mizzenmast, fore and main topsails and main yard, and was much damaged in the hull. Her official list was, 36 killed and 48 wounded, that of the Americans being 5 killed and 7 wounded. Decatur could have continued his cruise, but was obliged to accompany his crippled prize into port, where she was equipped as an American frigate. The young officer, as may be supposed, was hailed by the country as its foremost naval hero. Congress and several of the States voted him valuable testimonials for his gallantry. The following year, Decatur attempted to gain the open sea from New York, through Long Island Sound, with the Macedonian and Hornet. A British squadron of superior force, however, compelled him to run into the Thames River in Connecticut, and he lay off New London for months unable to get to sea. He was naturally impatient at being thus cooped up, and bitterly complained that traitors on shore, by means of "blue lights," warned the enemy whenever at night he prepared to break out of his imprisonment. He sent a challenge to Commander Sir Thomas Hardy of the blockading squadron, offering to fight two of the British frigates with two of his own, but the offer was declined and Decatur's frigates were afterward dismantled. Returning to New York, he assumed command of a squadron bound for the East Indies, and put to sea in the President. January 14, 1815, through the blunder of his pilot, his ship heavily grounded while going out. The next morning, Decatur discovered the British squadron in pursuit, consisting of the Majestic razee, the Endymion, Tenedos, and Pomona frigates and a brig. Of these the Endymion was the fleetest. After drawing her away from the rest, Decatur turned and attacked her. She was crippled and her battery silenced, when the American resumed her flight. By this time, however, the other ships had come up and opened fire. Escape was impossible and Decatur surrendered to the British squadron. Returning to the United States under parole, he was despatched to the Mediterranean, on the conclusion of peace, to punish the Algerine pirates that were preying upon our commerce. He did his work thoroughly and well, compelling the Dey to sign the most humiliating treaty ever made with a Christian nation. He obtained similar redress at Tunis and Tripoli. Decatur was subsequently created Navy Commissioner and made his residence in Washington at Kalorama, formerly occupied by Joel Benton. Commodore Barron's suspension began February 8, 1808. He resorted to the merchant service, and was abroad when war was declared. His suspension terminated about eight months afterward, some time after which he reported himself to the navy department, by letter, for duty, the war continuing two years after his becoming available for command. He did not return to the United States until the close of 1818. He declared that he had used every effort to reach home before during hostilities, but was prevented. A court, presided over by Captain Charles Stewart, afterward declared its judgment that such effort had not been made by Barron. The latter felt resentful toward Decatur, and called him to account for certain expressions he had been told were used by him reflecting upon his conduct as an officer. When appealed to, Decatur, as Navy Commissioner, declared that he held no personal enmity toward Barron; he deemed it unjust to other officers of the navy that his request to be restored to command should be granted. Barron opened a sharp correspondence with Decatur, which continued nearly a year. Mutual friends, or rather enemies, fanned the trouble between them, which ended in a challenge from Barron which was promptly accepted by Decatur. The duel took place at Bladensburg, on the morning of March 22, 1820, Commodore Bainbridge was Decatur's second, and Captain Jesse D. Elliott served Barron in a similar capacity. Decatur chivalrously surrendered his right to name the distance, which Barron made the shortest possible, eight paces, on account of his defective eyesight. Decatur was without a superior as a pistol shot, and, declaring that he did not wish the life of his antagonist, said he would only wound him in the hip. At the word "two," both fired so exactly together, that only one report was heard. Barron was struck in the right hip, as Decatur intended, and sank to the ground. Decatur stood erect a moment and was seen to turn pale, compress his lips, and press his hand against his side. Then he fell, the ball having passed through his abdomen. "I am mortally wounded," he said, "and wish that it had been in the defence of my country." His attendants helped him to his feet, and started slowly toward the waiting carriage. His pain was so great that after a few paces he sank exhausted, near where Barron was stretched on the ground. While the two thus lay near each other, waiting to be carried off, they shook hands, and each freely forgave the other. Decatur was lifted into the carriage, which reached Washington at half-past ten. He would not allow himself to be carried into his home until his wife and two nieces were sent to the upper floor where they could not see the dreadful sight. Wishing to save the distracted ones from the grief of witnessing his suffering, he refused them permission to enter the room where he lay. The news caused consternation and sorrow in Washington, where no man was more honored and loved than he. He thanked his friends for their sympathy, told them he had not long to live, and signed his will. "I am a dying man," said he, "and only regret that my wound was not received on the quarter-deck in the service of my country." When the surgeons proposed to probe for the bullet, he said it was not worth while as it had done all the harm it could. He remarked that he did not believe it possible for a person to suffer so much pain and yet live. But not once did he utter a groan. His agony was beyond description and did not cease until half-past ten, when he died. It seemed as if the whole male population of Washington and the adjacent county were present at the funeral, besides most of the officers of the government, members of Congress, and resident foreign ministers. The National Intelligencer, in an extra, said: "A hero has fallen. Commodore Stephen Decatur, one of the first officers of our navy, the pride of his country, the gallant and noble-hearted gentleman, is no more. He expired a few minutes ago, of the mortal wound received in the duel this morning. Mourn, Columbia! for one of thy brightest stars is set! A son without fear and without reproach, in the fulness of his fame, in the prime of his usefulness, has descended into the tomb."